Liebert DataMate Mission Critical Cooling System, 5-10.5kW, is a small footprint cooling system for 7×24 temperature and humidity control in network closets, computer rooms and other small spaces. Its low profile permits floor-mount or wall-mount installation, and requires little or no floor space. The Liebert DataMate is a split-system evaporator available in combination with a remote air-, water- or glycol-cooled condensing unit or a close-coupled water/glycol-cooled condensing unit, or as a self-contained, chilled water unit. Models are available to fit small computer rooms, requiring only five square feet or less of floor space, or can be mounted on a wall. Each split system has thermostat-type wiring to controls and condensing unit. System components are pre-charged with refrigerant using quick-connect fittings for fast installation. The unit is designed for front service access. Space-saving. The slim, compact Liebert DataMate may be wall- or floor-mounted, and requires minimal service access, limiting floor space requirements. High sensible cooling capacity. 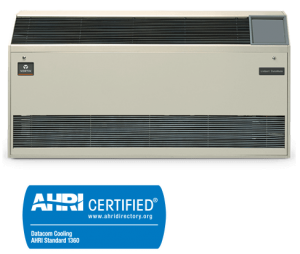 Unlike “comfort” air conditioners, Liebert precision cooling systems are designed for the cooling requirements of electronic equipment—80% of the capacity dedicated to the removal of dry “sensible” heat, and 20% for control of humidity. Reliable. The Liebert DataMate installed base is a testimonial to system reliability. Components include a compressor; a high efficiency copper-tube, aluminum-fin evaporator coil; and a double inlet, direct drive fan. Quiet. The units are designed to operate quietly with the compressor vibration isolated from the chassis. The cabinet is also insulated to further ensure quiet operation. On many models, the compressor-containing condensing unit can be remotely located to further reduce noise levels in the controlled space. 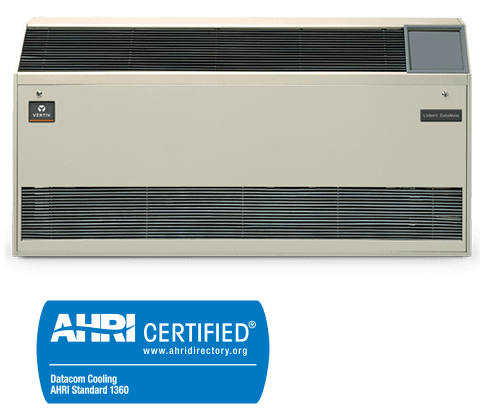 QuietLine outdoor condensing units are available for 6-8 dba sound level reduction over the standard models. Flexibility options. Liebert DataMate 60Hz systems are available in capacities of 1.5, 2 and 3 tons in air, water, glycol, and a self-contained 3 ton chilled water model (3-Ton models only in 50Hz). Systems may be configured as self-contained or separated from the condensing unit, depending on the model. Easy installation. All Liebert DataMate components are precharged, and require no field brazing, evacuation or charging. Precharged refrigerant lines are available to connect evaporator and remote condensing unit modules when required.